This Sunday sees the next set of cup finals take place as we head to Aveley FC for a busy double header at the venue, the day comprising of the Premier Division and Division Two cup finals on the day. There will be bar and refreshment facilities available at the ground on the day which you are all welcome to make use of. Each club involved has been allocated tickets which they are required to sell so please contact your clubs for tickets in the first instance. We also have a supply of tickets on the turnstile on the day at a cost of £5 each. We now look ahead to the games and provide some insight into who might be crowned cup winners at full time. On Sunday morning, we will witness the climax of this season’s Premier Division Cup competition as top of the table, El Valiente, take on local rivals, Flanders, in an intriguing cup final contest. For El Valiente, this is their first season in the league and it has been a largely successful one following their move from the Hackney & Leyton League over the summer. For a number of their side, it’s been a successful return to the top flight of the league following their previous endeavours under the Poplar Boys banner but this is their first cup final experience with the league nonetheless. Matt Guidera has guided his side to the top of the table albeit their closest rivals, Repton Park, remain in the driving seat with one more match to play. I’m sure they will look back fondly on a solid campaign that has culminated in a cup final appearance on Sunday at Aveley plus a terrific run in this year’s Corinthian Cup competition also. Their journey in this competition started in the first round where they entertained Ultimate Vision, running out comfortable 6-1 victors to secure their place in the quarter finals. They then faced the toughest task possible with another clash against Repton Park but made the home advantage count as they ran out 6-2 winners. That result proved to be even more important as they were fortunate to receive a walkover in the semi final as their opponents, FC Mexico, were unable to raise a side leaving them confirmed as finalists in the competition. Looking at the key men in their side, it’s hard to look too far past their talisman, Sam Edwards, who has netted twenty-four goals at better than a goal a game while Aaron Marston has chipped in with fifteen goals of this own too. At the other end of their pitch, Bradley Fields has played an equally important role with a number of cleansheet performances in between the sticks. As we take a close look at Flanders now, it has been another solid season for the east London side who have remained a difficult side to beat having only lost six of their fifteen league matches. This is of course their second successive trip to this final having been beaten finalists last season against Romford Elite, a record I’m sure that Gideon Boakye-Yiadom’s side will want to put right this year at Aveley. A side blessed with a host of non-league talent to call upon, it’s perhaps a shortage of goals this year that have cost them in comparison with the sides above them in the table with a fifth or sixth placed finish looking the likely outcome but they are side you underestimate at your peril. They started their journey to the final with a quarter final away at Warren United, never an easy place to go. A nine-goal thriller that morning went the way of Flanders who won 6-3 to secure their place in the last four where they went head-to-head against Brook Athletic. Naseer Ishanzaden was in fine goal scoring form in the semi final as he scored twice, adding to strikes from the experienced duo of Leon Lewis and Shomari Barnwell to complete a stunning 4-1 win, confirming their place in the final. When you look at the key men in their side, the seventeen-goal Barnwell is a good place to start and he’s somebody who certainly knows where the goal is. Kweku Gyasi has also notched nine goals of his own with the rest quite well spread amongst the squad. Looking at how the sides might fare, were matches to be played on paper as the old saying goes, you would have El Valiente marked down as the clear favourites given their loftier league position. But as history tells us, a cup final brings out a different mentality in players and you should always expect the unexpected. In the league, the first contest finished 4-3 to El Valiante with the second match ending 4-1 to the same side giving them, perhaps, a small mental edge. Congratulations to our appointed match officials on this final, a reward for the continued hard work put in by our referees across the season. The experienced Farai Hallam, a man who’s refereeing career continues to blossom into the upper echelons of the non-league circuit, will take the whistle and he will be ably supported by two extremely promising, up and coming officials, Morgan Conn and Tolu Sangowawa. 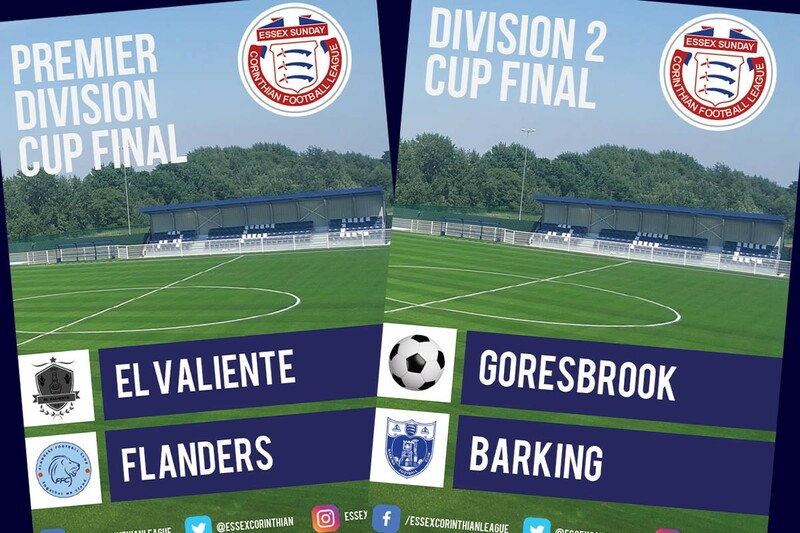 As we roll into the afternoon on Sunday, this season’s Division Two Cup will reach a dramatic conclusion as Goresbrook and Barking go head-to-head in the final at Parkside. It’s been a mixed season for Goresbrook with a period of mediocrity sandwiched between two exceptional runs in the earlier and latter stages of their campaign. Despite the indifferent nature of their season, they continue to make great strides following their re-introduction to the league a few years ago under the stewardship of the wily Phil Pafnouti who continues to enthusiastically run the ship to this very day. Following promotion from Division Three and a West Essex Trophy title last season, they reside sixth in the current campaign with four matches still to play, a very solid return indeed in what has been a terrifically competitive division thus far. Their run in this competition started at the quarter final stage where they were on the road, metaphorically at least, to their co-tenants Lonsdale. A sparkling 10-2 victory was the springboard for the improved form in the latter part of the season, that result booking them a semi final at home to Royal Albert. As semi-final performances go, they couldn’t have hoped for more as they took down the county cup champions in a brutal first half showing. Josh Keeble, Martin Tuohy, Charlie Barrett, William Cox and David Webster were all on target that day as they ran out 5-1 winners to book their place in the final at Aveley. Taking a close look at who their key men will be, Charlie Barrett’s name springs to mind quite quickly as their leading marksman for a few seasons now, somebody with pace to burn. Their experienced trio of Steve Butterworth, Joey May and Martin Tuohy will surely have a big role to play with much big-game experience between them at non-league level. The other half of the cup final line-up sees yet another cup final appearance for this experienced Barking side who do love a day out at a cup final. In their second stint with the league this season, they are perhaps best remembered for their absolutely outstanding Corinthian Cup final victory two years ago when they defied all the odds to beat Upshire in the final, a side unbeaten and a whole division above them! Their return to the league has been a successful one, forming part of an extremely competitive division this year in Division Two. With one league game to go, they can still secure a promotion place if other results go their way with Royal Albert the side likely to push them close for runners-up. Their run in the competition this season started in the quarter finals where they couldn’t have had a tougher draw taking on the champions elect, Dagenham United, at Mayesbrook Park. With there being very little between these sides in their matches so far, it took just a single Michael O’Brien goal to pick the sides apart in a 1-0 scoreline. Then in the semi-final, they had home advantage once again as they hosted Walthamstow Avenue with much at stake for the winners. In a largely competitive match, a Michael O’Brien penalty was all that separated them until Bradley Marston struck late on to send Barking to the final with a 2-0 result. When you look closely at who might be their men to watch, O’Brien could qualify for this with his haul of fourteen goals from eighteen games an impressive return for somebody has largely played behind the front men this season. Charlie Surridge has also been on target a few times with ten goals this season while you can’t discount the men at the back, marshalled by some excellent keeping from Stuart Williams between the posts. A side built upon a solid platform, you will never get an easy game when Barking are in town. Looking at how the sides might fare, it is a really tough match to call with the only match so far between these sides this season ending in an astonishing 5-5 draw back in January. If that scoreline is anything to go by, we could be in for a real treat but much will depend on how the two sides adapt their football to the surface and dimensions of the playing area at Aveley. Congratulations to our appointed match officials on this final, a reward for the continued hard work put in by our referees across the season. The hugely experienced, Emile McKenzie, takes the whistle on Sunday and he will be ably supported by the experienced and respected duo of Lanray Alapafujah and Billy Stevens who are both new recruits to the competition in the last few months. We wish everybody the very best of luck in their respective finals and look forward to some terrific matches!